For this week’s inspiration, I’m sharing five of my favorite fall color palettes for your coastal wedding or event. Most people instinctively think of summer when they think of a beach wedding, but lots of couples plan their celebrations in the off-season when the air is a little cooler and the beaches aren’t jam-packed. At least they do here in Jersey. Where we live near Long Beach Island, there are lots of venues that are open year-round and even though I’m not at all ready to let go of summer, every season really does bring it’s own beauty to the coastal landscape. This one will not surprise anyone since navy blue is my color. Navy is a classic, of course, and neutral in that you can pair it with so many other colors and each combo brings it’s own vibe. It can be dressed up or down and let’s be honest, it practically screams “nautical”. Pairing it with a champagne or cream color instead of bright white makes it feel less summery. This floral arrangement says it all. The very soft and subtle shades of peach contrast with the prettiest punch of burgundy. And the backdrop of the sea makes it all pop beautifully. Ok, I made up the name “rusty rose”, but to me, it accurately describes that elusive tint somewhere between summer pink and full-on autumn orange. 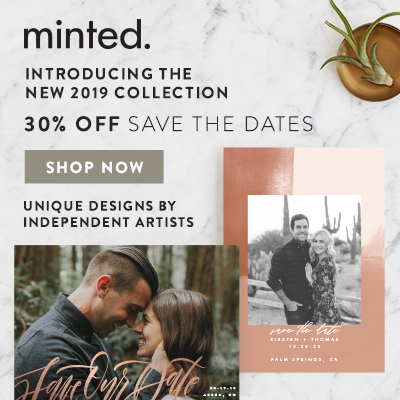 I am obsessed with this “Painted Desert” invite by Hooray Creative on Minted. How amazing would this be for a September or October wedding? This is Dusty Blue and Gold’s moodier cousin. It’s got a similar ocean vibe, but the deep hues are perfect for an event taking place later in the fall when the colors begin changing. So there you have it. Five fall color palettes for your coastal wedding or event. Comment below and share your favorite or one of your own.